Transportation in Hong Kong is a very important part of people’s everyday lives in Hong Kong. With over 7 million people living in such a small city, there must be a good transit system for residents and visitors to get around Hong Kong. Hong Kong has one of the best public transportation systems in the world. Anyone who has visited Hong Kong knows that it’s fast, convenient, affordable, and moves millions of people every day. Transit signs and travel information are in both Chinese and English. So if you can read what I’m writing right now, finding where you want to go in Hong Kong should be fairly easy. The most used form of payment in Hong Kong is the Octopus Card. You can use an Octopus Card to pay for almost all forms of transportation in Hong Kong. If you plan to pay with cash, make sure you have exact change. Most types of transportation in Hong Kong don’t deliver change upon payment for your ride. 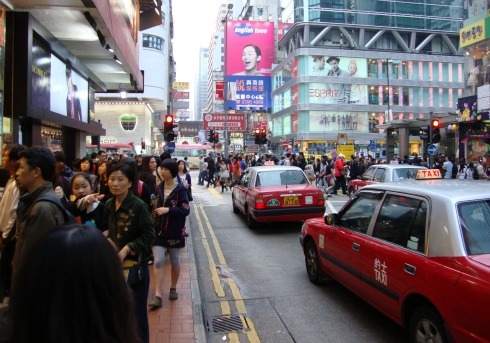 The busiest times of the day in Hong Kong are usually between 7:00am to 9:00am, and from 4:00pm to 7:00pm on the weekdays. The weekends seem to be busy all the time. Try your best to travel before or after these times, whenever possible. You’ll have a much better experience using the public transportation in Hong Kong if you do. When you want to go somewhere in Hong Kong, you have a lot of different options for how to get from point A to point B. Below is a list of all the types of transportation in Hong Kong. Before you get to Hong Kong you might be thinking “I’ll just rent a car and drive everywhere.” Trust me, that’s a bad idea. There are very few places to rent a car in Hong Kong and the prices are very high. The roads in Hong Kong are very hectic. People who drive in Hong Kong go at a very fast pace and have no patience for any slow drivers, especially those who don’t know where they’re going. When stopping in traffic, motorists in Hong Kong stop really close to the end of the bumper of the car in front of them. There were so many times I was scared the car I was riding in was going to crash into the car in front of us. The parking stalls in Hong Kong are the smallest I’ve ever seen. When a car is parked in Hong Kong, there’s barely enough room for the driver to get out of the car! When someone parks a car in a parking lot, they usually let all passengers out of the car before parking. This way the driver can park the car with enough room for him/her to get in and out of the car. If the passengers don’t get out of the car first, they may not be able to get out of the car at all! To make things even more difficult, drivers always back into the parking stalls. From experience, I know that people who park their car in Hong Kong are some of the most skilled drivers in the world. Cars drive on the left hand side of the road in Hong Kong. The steering wheel in the car is on the right hand side. If you’re not used to this way of driving, you’ll have to learn how to drive like this if you want to drive in Hong Kong. A personal vehicle is considered a luxury item in Hong Kong because of how expensive it is to drive one here. Most people living in Hong Kong don’t own a car. If someone living in Hong Kong can afford a car, they have to find somewhere to park it. They’ll have to pay a lot of money for that parking stall because space is very limited in Hong Kong. On top of that, gas is very expensive in Hong Kong. This is why most cars you’ll see on the road are Mercedes, Lexus, BMW, and other expensive cars. If you have to pay so much money to drive a car in Hong Kong anyways, why not buy an expensive car? The people who can afford to drive a car in Hong Kong are thought to have lots of money. Since most people who live in Hong Kong can’t afford a car, the majority of people use public transportation. The city has done an excellent job of making public transportation in Hong Kong very convenient. The MTR is Hong Kong’s railway system. MTR stands for Mass Transit Railway. It’s the most popular type of transportation in Hong Kong because of its convenience, affordability, and speed. The MTR is one of the best public transit systems in the world. 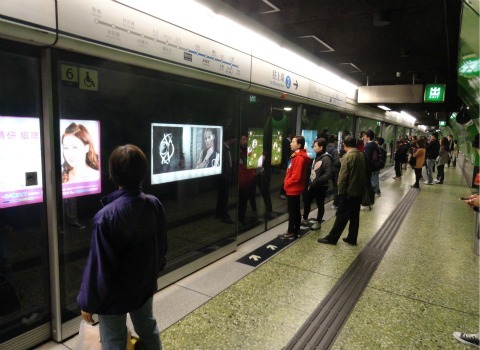 MTR stations are conveniently located close to popular tourist attractions and shopping all over the city. Each station even has its own shopping center, called MTR Malls, for anyone who needs to buy something before or after they travel on the MTR. For more information on the MTR, including a map of the MTR routes in Hong Kong, visit my MTR page found here. Taxis are all over the streets in Hong Kong. If you don’t own a car and you need to get somewhere quickly, a taxi is your best option. It’s quite easy to get a taxi in Hong Kong because of the sheer number of them on the roads. Taxis in Hong Kong can be a little confusing to travellers. There are 3 different colours of taxis that cover the whole city. These colours are Red, Green, and Blue. Each coloured taxi can only operate in certain parts of the city. Red taxis are the most common coloured taxi in Hong Kong. They can go almost anywhere in the city. There’s a good chance you may not even see any other coloured taxi than red, depending on where you go in Hong Kong. The only places Red taxis can’t go are Tung Chung Road and the southern part of Lantau Island. Blue taxis are the most restricted taxis in Hong Kong. They can only go on Lantau Island. Green taxis can only drive in the New Territories. If you see a green or blue taxi out in a part of Hong Kong it shouldn’t be in, they won’t stop to give you a ride. They’re not being rude; they just aren’t allowed to drive passengers in that area. If you get in a green or blue taxi and tell the driver to go somewhere this taxi can’t take you, they’ll take you to a taxi station. Here you’ll have to change to a coloured taxi that’s allowed to drive passengers in that area. So when in doubt, always pick the red taxi. The only exception to this taxi rule is that all taxis can drive to and from the Hong Kong Airport and Hong Kong Disneyland. Unlike a lot of cities around the world, taxis are actually a very affordable form of transportation in Hong Kong. For red taxis, the first 2 kilometres costs $20 HKD (approx $2.60 USD). Every 200 metres after that will cost you $1.50 HKD (approx 0.20 USD). Once you reach a fare or $72.50 HKD, the fare per 200 metres changes to $1.00 HKD (approx $0.13 USD). The fare for green and blue taxis is a little bit cheaper than red taxi fares. Taxi drivers in Hong Kong don’t expect tips at the end of the ride. You can tip the driver if you like, but it’s not necessary. For example if the fare comes to $82.50 HKD, people would pay that exact amount with Octopus Card or cash if they have it. Some passengers might give the driver $85 HKD and leave the change with the driver. A lot of taxi drivers don’t speak much English. To avoid any confusion that may arise when you get in a taxi, visit your hotel’s reception desk in advance. Ask the receptionist to write down the name of your destination in Chinese. If you get a driver that doesn’t understand where you want to go, give that piece of paper to the cab driver and you’ll be fine. The Hong Kong Tram is one of the oldest forms of transportation in Hong Kong. And at $2.30 HKD per ride, the Tram is also the cheapest form of transportation in Hong Kong. Hong Kong Tram carts consist of old style double decker trams that run on Tram tracks alongside the roads in Hong Kong. Most Tram tracks are found in the middle part of a road, in between traffic going in both directions. Passenger stops are in the middle area of the road and are quite frequent. So once you get off the Tram, you’ll have to cross the street. The Tram is one of the slower forms of transportation in Hong Kong. So if you’re only going a short distance, the Tram is a quick and affordable way to get you where you want to go. If you need to travel a long distance, I’d recommend using the MTR, bus, or taxi. If you’re tall like me (6 foot 1 inch), you’ll have trouble standing up on the top level of the Tram. My head touched the roof every time I was on the upper level. Most of the seats are on the upper level though. So watch your head while going up to the top level of the Tram. The seats on the top level don’t have much leg room between them either. If you have the choice, take a seat that doesn’t have a seat in front of it. Otherwise you may not fit if you have long legs. When you use the Tram, you don’t pay for the ride until you get off. The Tram accepts cash and Octopus Card payments. The Tram is a unique tourist attraction in Hong Kong that really defines this city. It’s definitely worth riding it at least once, just for the experience. The Tram is only available on Hong Kong Island and does not cross the Victoria Harbour. The bus is a very popular form of transportation in Hong Kong. If your destination isn’t served by the MTR or the Tram, chances are a bus can get you there. 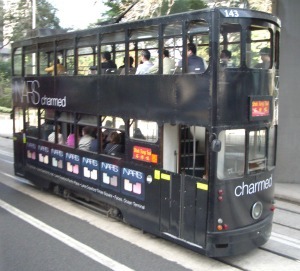 Most buses in Hong Kong are the double decker style, like the Tram. Even with the two floors on each bus, they can get very crowded at times. I’ve seen 3 buses with the same route number on them pass by, one right after the other, and all 3 buses had no room for new passengers. First thing in the morning and night time seem to be the busiest times of the day for buses. A lot of buses have a TV on the top level so passengers can watch the news while they ride the bus. If you’re tall like me, you might have trouble fitting in the seats on the bus. Some buses don’t have much leg room between seats. There were a couple times I had to take the aisle seat so I could put my legs in the aisle. The very front seats on the upper level of the bus have more leg room. Take the front seats if you have the chance. Make sure you pay attention to how much it’ll cost to take the bus to where you want to go. The bus has a flat rate that you pay as soon as you get on. This rate changes for every stop. Since MTR charges you for the exact distance you went, sometimes the MTR is cheaper than the bus. For example: A ride on the bus from Hong Kong Island to Kowloon that goes underneath the Victoria Harbour may cost $14 HKD. If you get on the bus when you’re 2 stops away from going underneath the Victoria Harbour tunnel, the bus will charge you $14. Even if you’re only taking the bus for 1 stop and not passing through the Harbour tunnel, the assumption is that anyone riding the bus at this point will go through the Harbour tunnel. That same ride on the MTR may cost you $5 or less. This is because the MTR tracks exactly how far you went and charges you that exact amount for travel. If the MTR doesn’t go the same route the bus does, you’ll have to either pay the $14 to get on the bus, or walk the distance of the 1 bus stop and save some money. So pay attention to the posted price of your ride at the bus stop before you get on the bus. You don’t want to end up overpaying for a short ride. Most of Hong Kong is surrounded by water. To get to certain destinations in Hong Kong, you may have to take a ferry. The Star Ferry is the most famous ferry in the city. It’s one of the most iconic attractions and forms of transportation in Hong Kong. Before the Victoria Harbour underground tunnels were made, the Star Ferry was the only way to get from one side of the Harbour to the other. For more information on the Star Ferry, visit my Star Ferry page located here. If you get sick easily on a boat, you should be ok riding on the Star Ferry because the ride is less than 5 minutes. Most other ferries are quite steady in the water. The only ferries you’ll want to be careful with are the ones that go to Macau, and the ferries that go to the other small Islands in Hong Kong. These rides can take an hour or longer to get to where you’re going. These ferries have a higher chance of wobbling around due to the boat going into areas without land blocking strong ocean winds. Some islands in Hong Kong are only accessible by boat, so you’ll have to take a ferry or small boat to get to these outlying islands. These outlying islands are not as highly populated as the rest of Hong Kong, so it might be a nice opportunity get away from the bustling city for a while. Macau is a popular destination for Hong Kong travellers. You can travel to Macau by ferry in about an hour. An economy class ferry ticket from Hong Kong to Macau costs anywhere from $150 HKD and up (depending on when you go). The ticket to return from Macau to Hong Kong goes for $140 and up (again, depending on the time you go). Depending on the type of ferry you take, the ride can be very cheap or quite expensive. The Star Ferry only charges $2.50 HKD ($3.00 HKD on weekends and holidays) for a one way ride across the Victoria Harbour. The ferry I took from Central to get to Ma Wan Park – Noah’s Ark on Ma Wan Island cost me $23 HKD, each way. This was the most expensive form of public transportation in Hong Kong to get to Ma Wan Island. 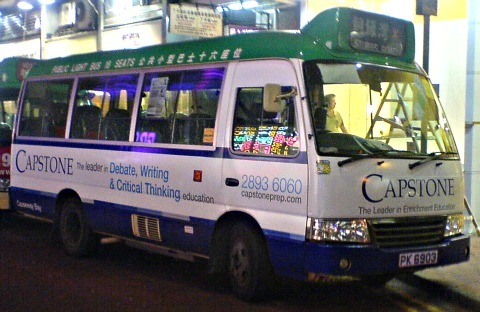 Minibuses are much smaller than the tradition bus in Hong Kong. They are much shorter and have only 1 level of seating for passengers as opposed to the double decker style of Hong Kong buses. There are 2 different colours of Minibuses in Hong Kong: Green and Red. Green minibuses are operated by big companies, have set routes, and run quite frequently. You pay for the ride when you get on the minibus. Cash and Octopus Card are accepted payments. Red minibuses are usually leased to individual drivers. These minibuses don’t have a scheduled route, and the price for the ride is set by the driver. Cash is usually the only accepted form of payment. You pay for a ride on a red minibus upon exit. Due to the smaller amount of passengers on the minibus, you should reach your destination much quicker than on a regular bus. As you can see, there are a lot of different forms of transportation in Hong Kong available to travellers and locals. A densely populated city like Hong Kong needs a diverse amount of ways to get around the city. Even with all these forms of transportation in Hong Kong, you’ll find travelling in this city is very busy most of the time. Try to travel during non peak hours whenever possible. You’ll have a more comfortable ride and a better chance of arriving at your destination on time.